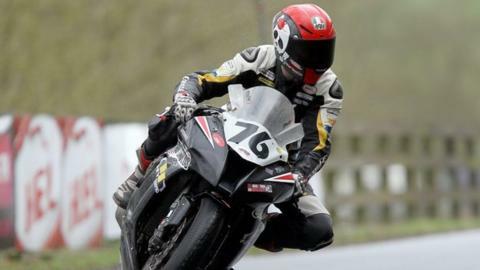 French rider Franck Petricola is set to race at the North West 200 next month despite suffering life-threatening injuries at the meeting last year. Petricola, 31, suffered multiple fractures and a head injury after crashing in practice last year and was in a coma for several days. The Frenchman was flown home after the meeting but made a full recovery and raced at Scarborough last weekend. "I am ready for it," said Petricola of his impending North West 200 return. "I don't remember why I crashed but I accept it. I am a big boy. "When you ride in a road race you know it is possible to have a hard crash like this. It is not a problem." He careered into a lamp post when he slid off his BMW superbike at Primrose corner during superstock practice, a day after his birthday. Just days after Petricola's accident, English rider Simon Andrews, 29, died after crashing in a race at the same North West meeting. Petricola broke two vertebrae, his left arm, his right elbow and right leg, several ribs and suffered perforated lungs in the huge impact as well as a serious head injury. "I hit my head and there was bleeding on my brain because of the trauma," recalls the Frenchman. He was treated within seconds of the crash by the travelling doctors from the race's medical team and transferred by helicopter to the Royal Hospital in Belfast. In a coma, his life hung in the balance for several days before he eventually regained consciousness. "At first I had no memory at all," added the native of Longwy, a small town on the Belgian border. "I didn't even know that I was at the North West when I woke up. I just saw all my family there at the bedside. "For me there was a bit of pain, but for my family and friends it was a very hard experience when I was in the coma." Petricola will make his North West return with the same Ice Valley BMW team that he raced for last season. "This year I want to have a lot of fun at the North West," he added. "I would love to be the fastest newcomer but I know my place, my level, because there are very fast riders from England and Ireland there." The Frenchman's near-death experience has done nothing to diminish his attraction to the Northern Ireland event, which takes place this year from 10-16 May. "On my first lap I thought it was incredible. "It was so fast and bumpy, especially the bit in the town, under the railway bridge. I love this track." Petricola raced at a 24-hour endurance race at Le Mans before making his return to the roads in Scarborough last weekend. "There was no fear. I am happy now, it is OK."
North West 200 event director Mervyn Whyte says he will be delighted to see Petricola back racing at Portrush. "Franck has made a great recovery and we will welcome him back to the paddock," added Whyte. "There are always risks in road racing but the North West organisers work tirelessly year after year to try to minimise the dangers. "The medical facilities that we have in place at road races in Ireland provide the fastest response times for any motorsport event in the world. "Franck owes his life to the men and women who provide that service and we are all very grateful to them for the brilliant work that they do."